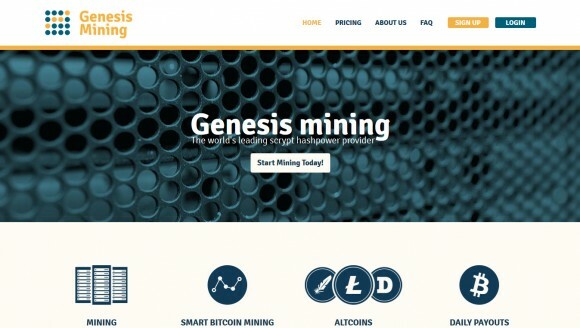 Genesis Mining is a relatively new and interesting Scrypt cloud mining service provider that has apparently been operating for a bit over a month already, so we have decided to give it a try and have been testing it for a few days already. 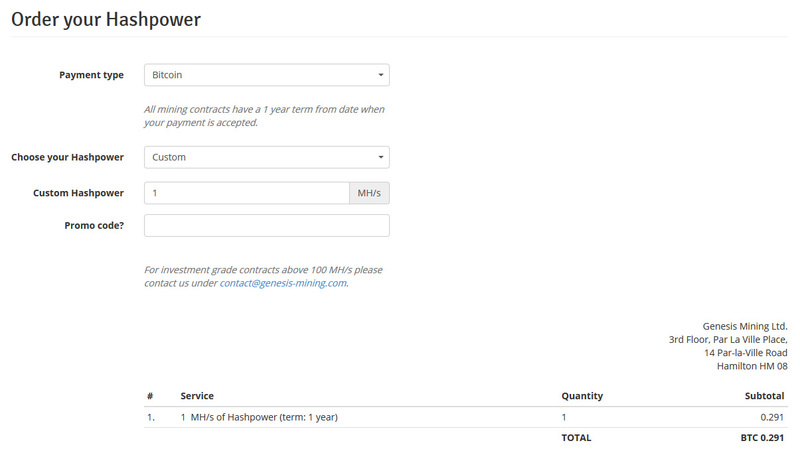 The company behind the service is apparently registered in Bermuda (the address is listed on the website), though interestingly enough the agreement when purchasing hashrate says “This Agreement is governed by German law”. It seems that Genesis Mining has already attended some Bitcoin and crypto currencies related conferences as sponsors or speaker, and the fact that they have been around for a while and that they are actively developing the service makes them seem more trustworthy. Though as usual we advise caution when checking out new services of this type as you may never know for sure, so never invest more than you can afford to lose. Genesis Mining offers the ability not to mine only Litecoin, but also multiple other Scrypt crypto currencies such as DOGE for example with user control what to be mined. There is an option to be payed in Bitcoins as well, with the service automatically mining the most profitable coins for you and exchanging them for BTC. Also you get to receive your earnings on a daily basis directly sent to your wallet, definitely an advantage over some other alternatives that do have weekly payments for example. Another good thing is that there are no hidden fees to pay such as percentage from your earnings for hardware maintenance or electricity bills, you pay a fixed price for the hashrate you want to rent and it is yours for a period of 1 year. 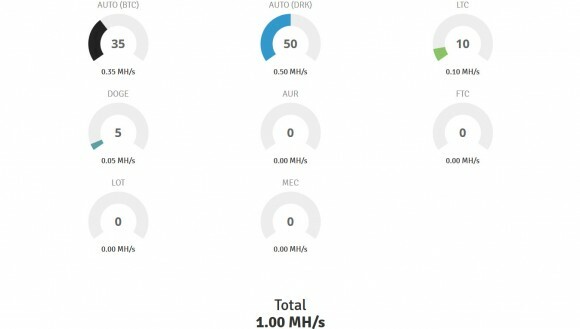 The standard cloud hashrate plans offered by Genesis Mining are for 2 MHS, 10 MHS and 50 MHS, though there is an option that allows you to set a custom hashrate like for example 1 MHS. For the purposes of our test we have purchased 1 MHS worth of Scrypt hashrate in order to try out the service and report our experience with it. The payment types currently accepted include Euro, USD as well as Litecoin or Bitcoin. 1 MHS of Scrypt hashpower currently costs 0.291 BTC, though when you increase the MHS you can get better price per MHS, so for example 10 MHS will cost you 2.585 BTC and 50 MHS will cost you 11.308 BTC. The page for ordering hashpower has an option to enter a promo code as well, you can use the following up to date promo code to get a 5% discount of the regular price CryptoMiningBlog5. This code does give you a good opportunity to test out the service starting with one or just a few MHS at a better price than the standard one. After we have purchased our 1 MHS hashrate for testing it took less than an hour for our payment in Bitcoins to be processed and our hashrate to be credited in the account. After you get the purchased hashrate credited into your account you have to setup the way you want your hashrate to work for you. By default it is set to 100% Auto (BTC) mode, so that you will mine various coins and get them sold for BTC and get payments directly in Bitcoins every day. You have a nice and clean interface with dials where you can set in percentages how you wish your hashrate to be distributed and in what crypto currency you want to get paid. You can for example use your hashrate to mine for Litecoin or DOGE along with a few other crypto Scrypt-based currencies such as AUR, FTC, LOT or MEC. Interestingly enough an option to get payment in Darkcoin has also just been added, meaning that what you have mined gets sold for DRK and you get the amount sent to your wallet. Although this easy to use interface does look very nice it lacks something very important and that is some information about current profitability. This is a must have feature in order to give the users of the service some information on what could be the best option for the moment based on the current exchange rates. At least some approximates would be nice, otherwise people would have to track manually all of these currencies to see what to mine all the time in order to get the maximum profit, or the idea here is just to choose the Automatic BTC option and not care much. 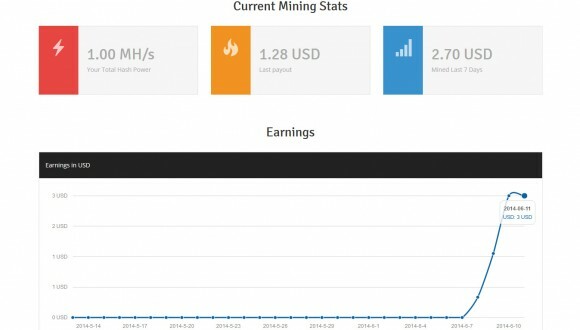 An estimate on profitability based on the last 24 hours of mining would be nice to have and very useful, for the purposes of our tests we have decided to start with 100% to get payment in Bitcoins, even though this may not be the most profitable option on the long term. We are also going to try out mining with the other options as well. The main dashboard also is clean and nicely structured giving you a brief about your current hashrate, last payment in USD as well as the total payments for the last 7 days again shown in USD. Below that you can find a chart with the daily earnings you get each day for roughly the last month. What we are missing here is an option to see the total earnings you have received since you have started using the service, something that is really useful. Another nice feature that we would want to have here is not only earnings calculated in USD, but also in BTC for example to go along the USD estimate. The service does daily payments, though so far it takes more than another half of day to get your daily payment for the previous day and this can use some improvement. And now a bit more about the return of investment you can expect and the actual profitability of the Genesis Mining cloud mining service according to our tests. 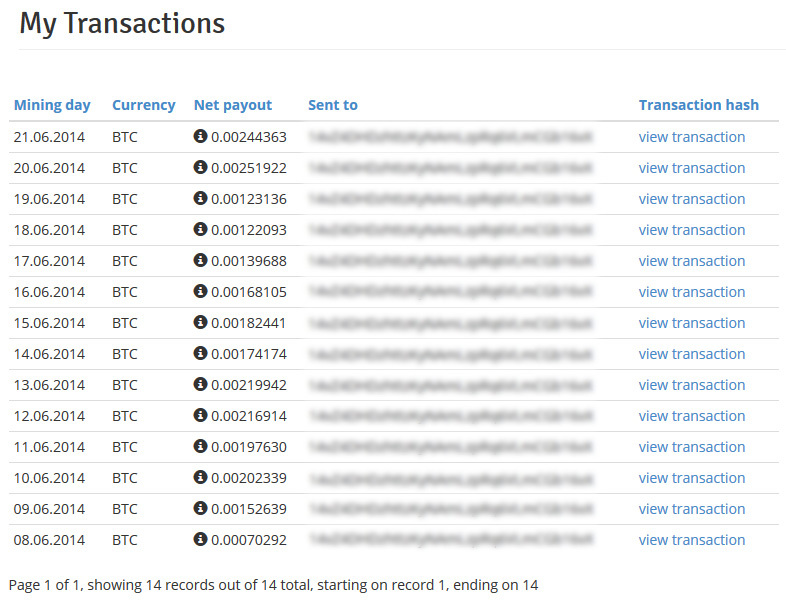 For the 1st day (actually less than 12 hours) we have received a payment of 0.45 USD or actually 0.00070292 in BTC. 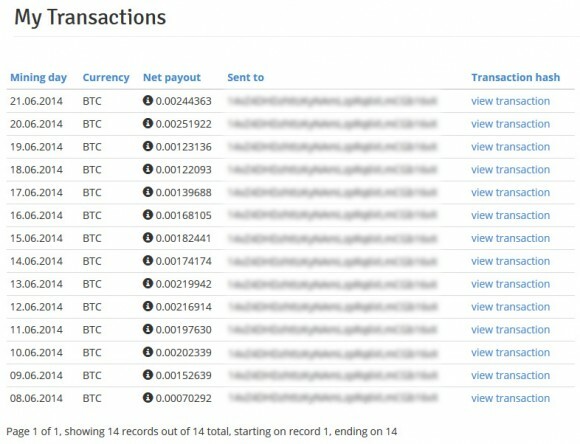 The second day was a bit better with a payment of roughly 0.97 USD or 0.00152639 BTC. The third and fourth days were even better with 1.30 USD or 0.00202339 BTC and 1.25 USD or 0.00197630 BTC. Considering the fact that for our 1 MHS worth of Scrypt hashrate we have paid 0.21387012 BTC by using a discount code and taking into account the earnings from the last two days as a reference we will need about three and a half months to break even. This of course will be true if the current profitability remains the same as it is now, meaning that we are going to have a decent profit for the rest of the contract period that is 12 months in total. Without the discount however and at the current standard price for 1 MHS the break even time will be close to about 5 months of the daily profitability remains the same. So far our general impressions from the service are positive, even though it still can use some improvements in terms of functionality and a speedup in the time it takes to get your earnings would also be nice. It would also be nice to have some sort of a contact/support section for actual customers, so that you would not have to use the generic contact form on the website in case of a problem or question. We are going to continue using the service for the next year until our contract is over, so you can expect more reports about the service as we are ready to share more of our experience using it. Considering the fact that there are still not many options to go for a Scrypt cloud mining service, this one is definitely worth keeping an eye on.